See what RE:Match can do! 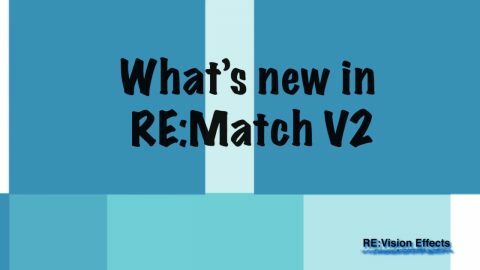 See what’s new in RE:Match v2! RE:Match is our solution to help you with camera matching problems. In this overview, you will see new features added in RE:Match V2 as well as some differences between RE:Match V1 and V2. 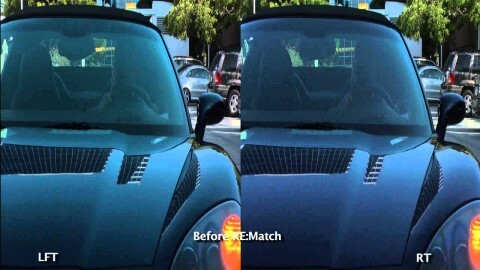 In this example, you will see that RE:Match Stereo matches one view to the other, despite the fact that the car reflects a slightly different color at a different angle. 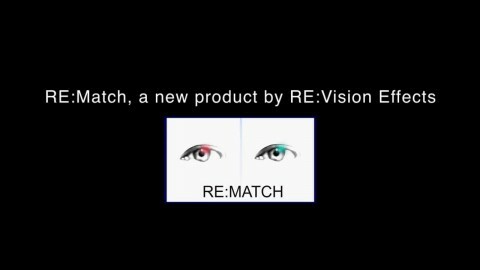 Nick Brooks, Academy Award and Emmy Award winner for visual effects, says RE:Match provides "amazing color matching for stereo pairs... really!!! The specular and optical aberrations matching is high quality and very effective." Jonathan Banta, stereo pipeline designer, says "The smart guys at RE:Vision Effects have created a very cool toolset that I have been lobbying for for a long time. Brilliant!" Color correct one shot to match another when using multiple takes or cameras. RE:Match can match using the whole image or part of an image, and can use any point in time. RE:Match improves stereo footage by knowing that the two views are captured at the same time with a small distance between the views. Set a color correction using several automatic methods. Color correct using a particular point in time of the sequence to match. RE:Match assumes that both image sequences are taken roughly at the same location but perhaps were not shot at the same time or from the same point-of-view. Dissolve color corrective matching between user-selected reference frames along the timeline. Great for shot-to-shot match. Your reference can even be a set of stills. Matching for stereo pairs takes advantage of internal per-pixel registration using optical flow methods. Stereo pair matching takes into account occlusions between the two views. Stereo pair matching takes into account that the two images may not have corresponding details at some of the edges of the frame. Stereo matching has controls for making details, such as reflections, lens flares and specular highlights match between the two views. Methods provided to remove or attenuate on-lens artifacts (such as water drops on a lens). You can use at any point of your pipeline. Because RE:Match uses internal pixel registration, stereo matching does not require image alignment prior to use. Visualization modes are provided to guide what RE:Match is doing internally. Installed plug-in will work with After Effects CS6 (and up) and Premiere Pro CS6 (and up). Note if using AE CC 2015, that you will need to use 2015.0.1 (13.5.1) or later. Installed plug-in will work with After Effects CS5 (and up), and Premiere Pro CS5 (and up). Pro license works with After Effects, DaVinci Resolve, Fusion Studio, HitFilm, Natron, Nuke, Premiere Pro, Scratch, and Silhouette. Pro license also works with regular product of any supported host. Render-only licensing is for use with After Effects' render-only program 'aerender'. Render-only licenses do not work in AE’s Render Queue (for Render Queue rendering you need an interactive license). Note that the RE:Match render-only licenses only work on projects written with an interactive license (so you must have at least one standard, floating or Non-Floating interactive license for the render-only licenses to be valid).